H.H. the 16th Karmapa Rangjung Rigpe Dorje (1924 -1981) was born in Derge province in Eastern Tibet. 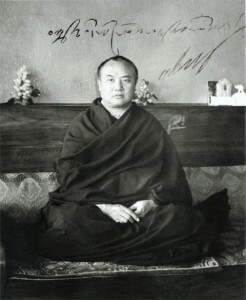 The previous Karmapa Khakhyab Dorje (1871-1922) left a letter setting forth the circumstances of his next incarnation. On the basis of this letter the authorities of the Tsurphu monastery were able to successfully locate the child. In 1931 the young incarnate was ordained as a novice monk and offered the Karmapa’s ceremonial robes and the Black Hat. Karmapa studied in Tsurphu monastery for four years, deepening his meditative realization of Sutra, Tantra, Mahamudra, and the “Six Yogas of Naropa”. As a boy he displayed an extraordinary natural insight and often told his teachers about his previous incarnations. At the age of 23 Karmapa received his final ordination, along with the initiations and explanations of the highest Karma Kagyu teachings. In 1959, due to the occupation of Tibet, Karmapa decided to flee his country, realizing that the cause of the Dharma would be served best by escaping the ever-tightening grip of Communist China. Accordingly, accompanied by an entourage of 160 lamas, monks and laymen, Karmapa left Tsurphu monastery, the traditional seat of the Karmapas, and proceeded towards Bhutan. Under Karmapa’s guidance the party was able to take along the most precious statues, ritual items, relics, thangkas and books, which had been preserved at Tsurphu monastery over the centuries. The ruler of the state of Sikkim in North-Western India offered the Gyalwa Karmapa Rumtek monastery, which was built during the time of Karmapa’s 9th incarnation, Wangchuk Dorje (1556 -1603). Karmapa undertook the construction of a new monastery in Rumtek, which due to the generous help of the Indian government and the ruler of Sikkim, was completed in four years. The new monastery in Rumtek became Karmapa’s official seat outside Tibet and a center of Buddhist study, ritual, and practice. In 1974 the 16th Karmapa led a party of Karma Kagyu lamas to the West, visiting Europe, America and Canada, and for the first time people in the West had the chance to participate in the Black Hat ceremony, which Karmapa performed on a number of occasions. 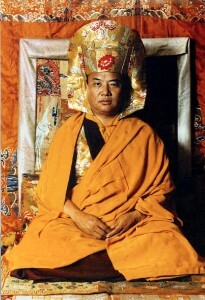 Invited by his first Western disciples Ole and Hannah Nydahl, Karmapa arrived in Copenhagen, Denmark in December 1974. In November of 1976, Karmapa arrived in New York for a tour through the USA, and in the following year he spent six months on tour in Europe during which he visited Sweden, Denmark, Germany, Holland, France, and the United Kingdom, including London and Manchester. In May of 1980, Karmapa again visited the West, stopping for lectures and ceremonies in London, New York, San Francisco, and Boulder, Colorado. H.H. the 16th Gyalwa Karmapa died on November 5th 1981 in a hospital near Chicago.